This is what we have been waiting for since the paints went into the bottles. These are great! I want to thank my husband, John, for coming up with the final concept - and making them for us. This is an introductory price - it will go up in January 2010. 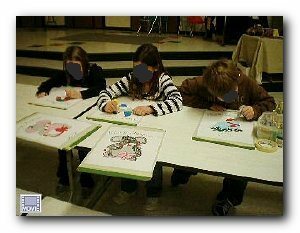 They set on a table and they fit in the canvas Paint Carrier (C500) that we already have. That means you can store them by hanging them on a nail - or carry them with you if you're traveling to a class or on vacation. You can set them out on a flat surface and do your projects without having to pull the paints out of the Carrier and putting them back in all the time. With the Carrier's loops, you can put your accessories right in the carrier and four (4) of the Paint Racks (C350) will fit in there and carry every bottle of paint in the Line (with a few holes left over). C350 -$7.50 each - (for the rest of this year) It takes four (4) Paint Racks to store all the paints in the Line and those four (4) Paint Racks will stack right in your Paint Carrier (C500) Each Rack holds 28 Paints. For the rest of the year I will be putting out five (5) to six (6) transfers a month so you will have lots of new choices for gifts and shows. I painted this one at the Monroe County Fair while I was waiting for customers to stop and see me. It got a lot of good comments. It's fast and easy - just outline and fill in. I hope you all enjoy it as much as I do. This one is from Christy Lee. It will go on a Mini Flag (P322) or a shirt or any thing else you want something exciting on. Although Dogwood comes in many colors, I think we mainly see them painted in white. Since it was going to be white, I thought I would put it on a colored shirt so it would show up better. This set of designs is among my favorite - so here's the second one. It will go on just about anything - but it's really great for a Mini Flag to hang on the front door or in the entry hall. 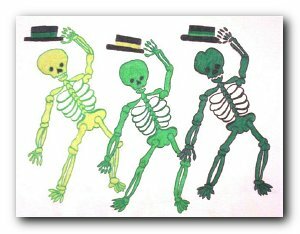 I have this on a light blue t-shirt. I really like the way it turned out. Well….it's hot….it's cold….it's rainy….it's exceptionally dry….the wind is terrible….it's just opposite the way it's supposed to be!!! It's that way everywhere. This is just a weird summer for all of us. It kind of makes you wonder what the winter is going to be. The leaves are already changing colors here and the birds are flocking to head south. Now something that's out of the Line: Large Blotter Pads (C452) is no longer in the Line as of September 1, 2009. I don't have that many orders for them and they're a bear to ship. C351 - Blotter Pads (2) will stay in the Line. These are sold in 2's and are exactly one (1) C352 cut in half. So they are actually the same price as each of the bigger blotters was. **I'm glad to see that the 'costumers' around the country are finding our paints. They are perfect for any 'costume department'. 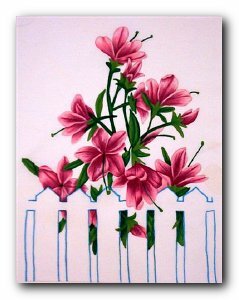 They can be used from the ball-point tip, with a brush or with an air-brush. The paint dries fast and the costume can go out on stage in just a short while after being done. You'll find a new 'Accessories' page in your newsletter. It will include the new C350 - Paint Rack and will not include the C352 - Large Blotters. Feel free to copy this for your customers. On the other side of the 'Accessories' page is a new paper on 'Uses for Fabric Glue'. I am open to making this a bigger paper if you have more ideas on the uses of Fabric Glue (C379). I just wanted to get suggestions out there for those of you that have never used it before. 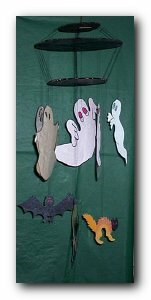 I'm including the 'How To' page for the new Halloween 'Make It and Take it' Class. I want to thank all the good folks that painted these so I could get them out this month so you would have time to set these classes up at your schools, Girl Scouts, etc. (The people that come to my workshop every month don't always do what's listed - a lot of times they just help me with things so that I can get them out in the next newsletter.) I figured the earlier the better. Hope you have fun doing the designs. 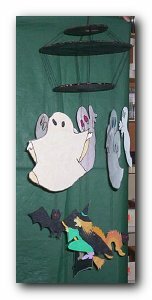 Having not made any mobiles before - John and I spent a lot of time just getting the three (3) pieces of cardboard strung together. The next morning I strung the designs on. That went pretty fast. I had already cut out the designs so they were ready to string up. 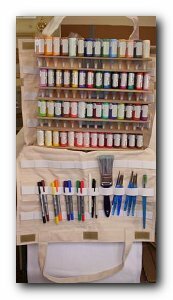 Be sure to visit our accessories page and see all the tools and pens to make fabric painting easier. With our accessories you to can make professional looking designs and pictures come to life on clothing, table cloths, linens, or most any material. I have had some questions on having empty bottles for sale [C557 - (5) -$3.00]. One use for them is to make your own colors. Using colors that are already in the Line, you can mix the colors that you want to use on a particular design. Sometimes folks want to match the color décor of a dining room or bedroom. Maybe you want to do something on a particular color of clothing and need just the right color to work with. If you use an empty bottle to mix your color you will be able to use that color another time in the future. I suggest that as you are mixing the color, you be sure to write your formula down so you can re-mix it when you run out. 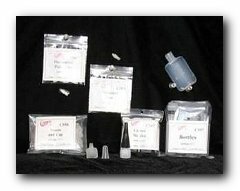 You will need to order C557 + C556 (Decorator Tips - (10) for $3.25) + C558 (Nozzles and Caps - (10) for $3.30). Since you get five (5) bottles to a package, you need to order two (2) sets of bottles to go with the other two (2), since they come in packages of ten(10). Another use for these items is to divide your existing paints into more than one (1) bottle. This is especially good for those of you that teach painting classes. You can buy one (1) bottle of paint and divide it into two (2) or three (3) bottles so that more folks in your class can use the same colors. This works well if you're having classes with kids. They always seem to want to use the same colors as their friends are using. For those of you that are running classes with the 'Quilt of the Month' quilt blocks, where your students are all doing the same design, this is especially good. Of course, the best way to run the monthly quilt block classes, are to have them buy their own paints so they can continue painting at home. If they buy all the colors that they need for the first quilt block - then add the colors as they need them for the blocks as they come out - that makes your sales higher and gives them the opportunity to buy other things to paint in between the class times. This way they can gradually build up their paint stock and as their paint colors increase, they will want to do more things with them. There are un-numbered dots to fill in with colors that you mix up on your own (like I talked about in the previous section). Another item that a lot of folks don't understand about is C548 - Sandpaper Blotters (5) for $3.75. These are medium grit sandpaper. These are the best things to paint on. You put one under what you are painting (or in between the front and back of a t-shirt or sweatshirt) and the Sandpaper Blotter holds the item still so that you can paint it and it keeps the paint from going through to what ever you are painting on (or to the other side of a shirt). For those of you that have been painting for a long time and are used to using the hoops - this works much better. You don't have to worry about smearing the paint when you move your material on the hoop and you don't have to let the paint dry before you move to the next section. 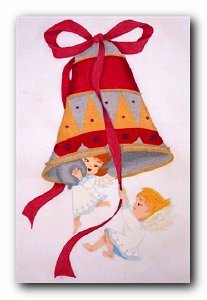 I know there are those of you that have to paint lying down and you need to have the hoop to hold the item that you are painting, but even in those cases, putting a Sandpaper Blotter on your hoop works better than using a blotter pad. Just cut the Sandpaper Blotter to the same dimensions as a C366 - 10" round Blotter. The grit holds the item very still for you to paint without having to stretch it out when you put it in the hoop. The Blotter Pads [C451 -(2) approx. 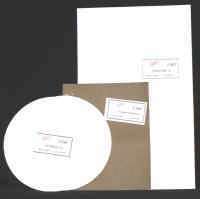 10"x12"-$1.75 and C452 -(2) approx. 12"x20"-$3.25] are good for doing washes and using a brush [C460 - Fabric Brush Set (3) or C470 - Fabric Brush Set 2 (3)] to paint with. It holds the material for these techniques and keeps the paint from going through to what you are painting on top of or through to the other side of a shirt. I am having so much fun with the new Quilt Blocks of the Month. It’s fun trying to explain new techniques in writing. On the Wild Deer Quilt blocks – right off the bat, I explained something wrong in the newsletter. When you're doing "One Stoke Fabric Painting" I should have said that you fill each corner of the brush with a different color. When you order the WDQ-01 I have a 'how to' page in there with pictures. I think that will explain it a little better. If any of you have suggestions on how to write up directions on this be sure to get them to me. Remember that you can order the Monthly Quilt Blocks during the month that they come out and you can order any back ones that have already come out. So – if you decide this month that you want to do one of the new quilts– you can order this month's and last month's blocks. If in June you decide that you really would like to do all the quilts – you can order the blocks for June -and all the ones that came out earlier in the year. 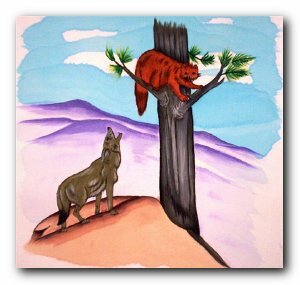 The Wild Animal Quilt, also, has extra tips in the directions for the first block of the year. 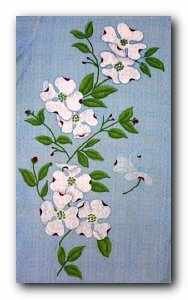 Christy Lee painted and charted this quilt and put in the extra tips to make it easier for you to paint the designs. The Quilt Blocks of the Month seem to be going over well for this year. I never know how you all will like them until I get them out there. Be sure to order the first block of the series to get the extra directions that are for the whole series. We have a lot of instructors out in the field that have pretty much quit instructing and others who are new and don't quite know how to get started. I thought this would help both sides. The quilt blocks come out once a month. I thought this would give you a built-in class session, or sessions, that you could do each month. Each set teaches different things. 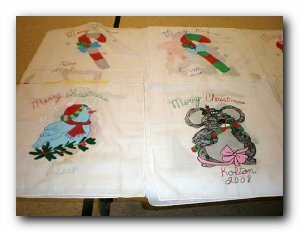 At the end of the classes the students don't have to sew and quilt these into a quilt, they can put two (2) together and have a two-sided throw pillow. They can use each one individually and put a plain quilt block on the back and make a throw pillow. 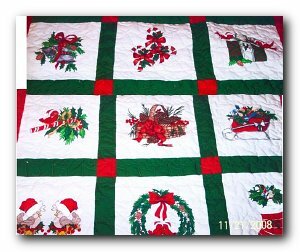 They can sew all the blocks together at the end of the year, put a piece of blanket material on the back and use yarn to tie it together as a throw for the back of the couch or for use in the car for trips. You could also frame the finished product with a wooden hoop or a regular frame. (You can pick up lots of frames in yard sales.) 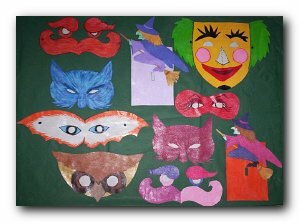 Just use your imagination on what to use the finished products for. The transfers are all great for putting on a shirt, also. 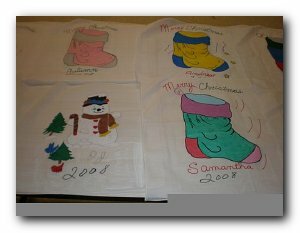 You can use the quilt block to learn on - then put the transfers on shirts or pillowcases. 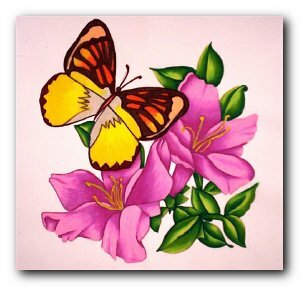 I know that some of you are not into quilting, but you like the sets of transfers. Instead of quilts you can make throw pillows with a different design on each side. That would give you six (6) different throw pillows. If you want to make twelve different throw pillows - or six - or nine -you just need to order extra sets of blank quilt blocks (P601-$5.25) to use for the back.. 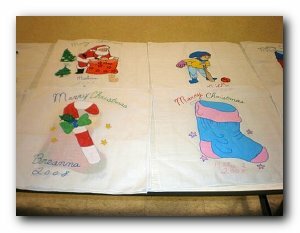 Instead of using the transfers on quilt blocks you can put the designs on shirts, flour sack towels (P327), mini flags (P322), tablecloths (P1220, P1221, P1222, P1223), a Wallhanging (P324), dresser scarves (P326), placemats (P1289), tote bags (P1492), pillow cases (P1595), pants, skirts, jackets. There are just so many different ways to use the transfers. I like to put several designs on a single shirt. I buy men's shirts at yard sales and then I make it into a theme shirt. I might make a unicorn shirt, or a shirt of flower faces. I have a Christmas shirt with many different designs on it. How about a snowman outfit on a sweat suit? There are just sooo many ways to use the Quilt Paks it boggles the mind. 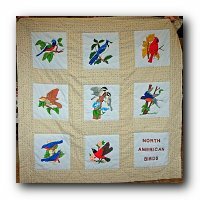 Quite a few of you have asked for the Bird Quilt Designs to come back in the Line. Would this work? Would you like a different extra design to bring it up to nine (9) blocks? I kind of liked the letters, but I think I might put the 'North American Birds' block in the center. As you can see - everyone has their own ideas on how a design should be painted. We try to make it fun for everyone - even if they're new like Jamie Curtis in the back row. We work - we learn - we play. Jean was there, too, but behind the camera. At some meetings I try to teach different things - like at the Brooklyn June Meeting - it was how to arrange transfers to iron on all at once, or how to do your own thing. 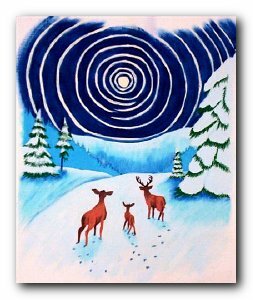 Makes a great gift for children who love to color and paint! 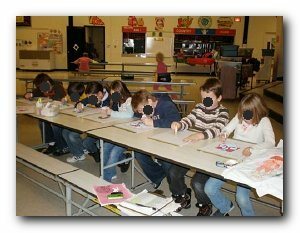 You've seen my mention of the latchkey group here in Michigan. Their teacher, Vivien Gunderson, sent me some pictures, but asked me not to put any of the kids faces out in the world, just to keep them safer. 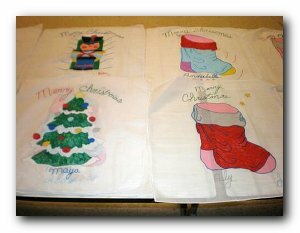 So here you are - what some of the Michigan Latchkey Kids have painted (handkerchiefs -mostly for gifts). 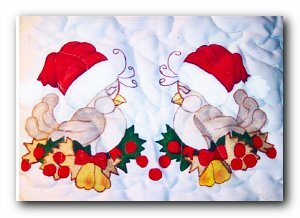 Rene McDonough, in Venice, FL wanted to do the Christmas Quilt for her daughter, but her daughter didn't want Blue Birds on her quilt so Rene painted in her own colors - and changed out one of the blocks for the Christmas Basket (T4235). The birds in this picture are done with 301-302 & 303. Striking!! All the instructor/dealers that I put in this section have a lot to teach and would like to teach all they know to you. So contact them and get started now. 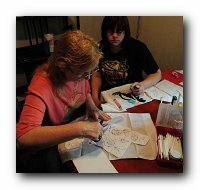 You can now contact Lisa Kinsley in Blanchester, OH for classes and supplies. She just got started and would love to hear from you call 513-535-3175 or email her at harleymama123160@yahoo.com. I know I have others in British Columbia that order from me - this store might be just what you’re looking for to pick up your products near you instead of waiting for them to come by Post. We're also on EBay and Amazon. We're getting better known all the time thanks to all of you out there. Keep up the good work!!!! 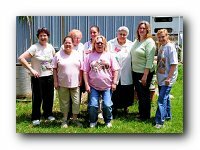 Blue Earth, Wisconsin – Sharon Pausewang will be glad to teach you how to use your paints. If you would be interested in taking classes with her contact her at (507-525-1037). Millersport, Ohio – Phyl Phillips is there for you. If you would like to take classes with her contact her at (740-928-3117). 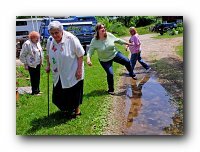 Linden, Michigan – Halleen Fisk has lots to teach you. I try not to keep her so busy that she doesn’t have time to have classes. If you would like to take classes with her contact her at (810-735-0100). Alberta, Canada - Beverly Craig - This is a very nice lady, which has been helping people to learn about Cameo for a while. If you are in that area, you can give her a call at 403-224-3565. She will be glad to share her expertise with you and fill any orders that you have. She works with a wide variety of folks and would love to work with more. 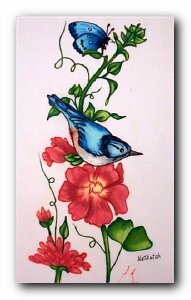 We would love to show our readers what you've done with Cameo Paints. Send us gingerscameo@aol.com or webmaster@gingerscameo.com some of your pictures and be sure to tell us about them and yourself. I’ve been trying to hold down the price on shipping – but now I’m starting to lose money on it and prices are going up at the Post Office starting May 14th. (Prices at other shipping places have already gone up.) The increases they are talking about, on top of what I was already losing, means that starting May 1st, 2007 my shipping prices are going to go up. Remember that shipping is figured on your retail total before your discount. If you think I should give you a lower shipping amount on your order because it is a small order, you can call and we might be able to adjust it some. No promises though. I’m not in the business of making money on shipping, but sometimes the small orders are what off-set the big orders. Well, I guess that's all for this month. Keep that those suggestions coming. I need every one of them. See you at a meeting.